← What’s the Best Money Transfer Service for You? Every smart adult should know that in order to get the greatest return from your income and possibly save up for the future, you should create a monthly budget and STICK TO IT. This is your first step toward reaching your financial goals. Although sometimes, it can be overwhelming. But hey, budgeting doesn’t have to be hard with the right system and tools. To help you make budgeting less complicated and stress-free, here are 4 budgeting tools and resources that you can access for free. Although everything can be done digitally nowadays, it’s still important to go old school and have a “tangible” budgeting tool. There are a lot of planners designed specifically for tracking your expenses like this one from Mead where it already provides you with cash flow worksheets and monthly pockets for your bills and receipts. 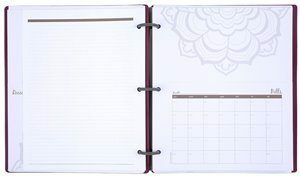 But a simple notebook can definitely do, what’s important is that you have a reliable tool to write down all your expenses and incoming resources in order to get a clear picture of your monthly cash flow. Dave Ramsay, America’s trusted voice on money, strongly suggests the Envelope system for household budgeting. This system requires you to figure out major budget categories and specific target amounts. What you do is you label a bunch of envelopes according to different budget categories and fill them with the specific amount of cash. The benefit here is that you can really get the feel of actually “spending” cash and literally see when you are getting close to “running out” of it. You can actually purchase the official Dave Ramsay envelopes but you don’t have to do that, you can simply buy ordinary colored envelopes or folders and use that for your household budget system. If you are running a big household and a business on the side, you can use the Microsoft Excel that is already installed on your computer. Here, you can find simple budget templates or create your own one. What’s great about Excel is that it will already do the math for you. Of course, who would forget the importance of internet? There are a lot of apps or sites like Mint, BillGuard and Expensify that are available for you to download or access for free. All you have to do is test out what works for you the best. If you need help on what to choose, here’s an article where I wrote about my budgeting app recommendations.